Good morning! 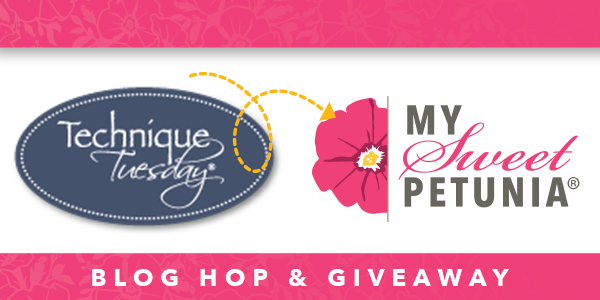 Excited to day to be hopping along with both the Technique Tuesday AND My Sweet Petunia Design Team. This hop is full of inspiration and fun, as well as prizes! You should have arrived here from Ceal Pritchett - entire blog hop list is at the bottom if you get lost along the way! 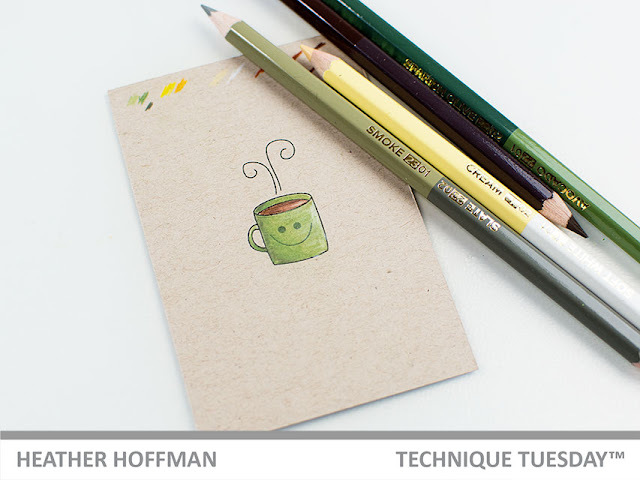 I'm showing a fun technique today for using your MISTI along to help with using colored pencils on your images! 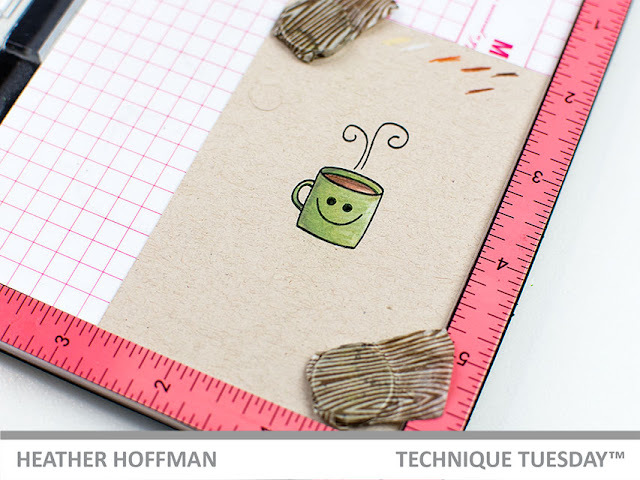 First off, line up your image on your paper that you are going to be using, and stamp with the MISTI. Careful - don't remove your stamp from the image yet! Next up, color in the image with your colored pencils. Cute, right? However, do you notice how the colored pencil covers up some of the detail of the stamped image? Makes it less clear and more muted? This is where the magic of the MISTI comes back in! Take that image back to your MISTI and restamp over the top! See the difference? 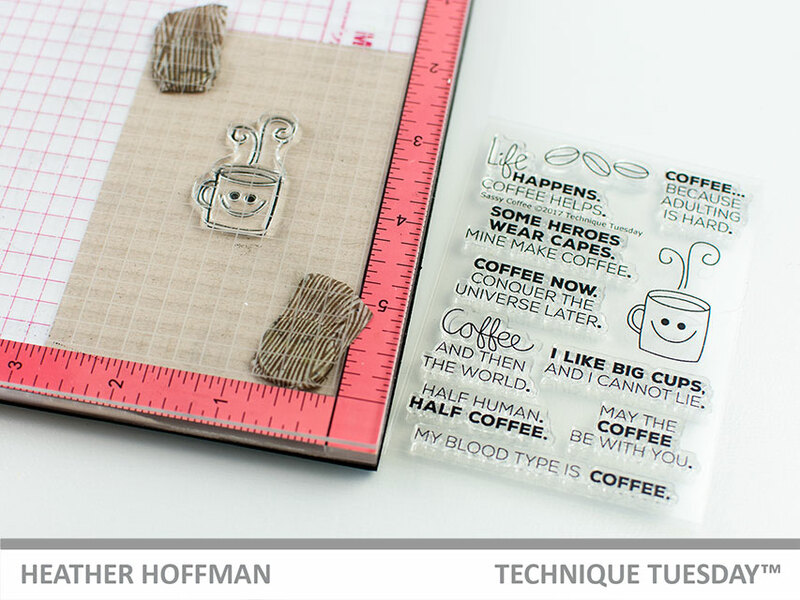 Now, if you stamp and don't heat emboss, make sure and give your ink time to dry. I used a dye ink, and it did sit on top of the waxy pencil for a bit, but giving it a bit of time to dry it stayed on just fine. For my card I used the cute little Sassy Coffee stamp set from Technique Tuesday. I also used Circles Crafting Dies and Little Labels to heat emboss my sentiment. Some fun pattern paper from Carta Bella, a doily and some twine for texture, and a bit of black matting around the outside of the floral pattern paper finish this card off! Gorgeous Iris ... love the texture of the twine. I love love love the iris think I might try that, the worst that will happen is I do not make it right and try again. I also love your coffee card as I sit here drinking my morning coffee. I color with pencils, it is the thing I love. Don't you love that you can stamp over an image and get perfect placement. Such a bonus with the MISTI. Love that coffee card, but the flower is beauteous as well. Your use of kraft is super. Thanks for sharing! I love the coffee sentiments. I need that right now!!!! Great cards... 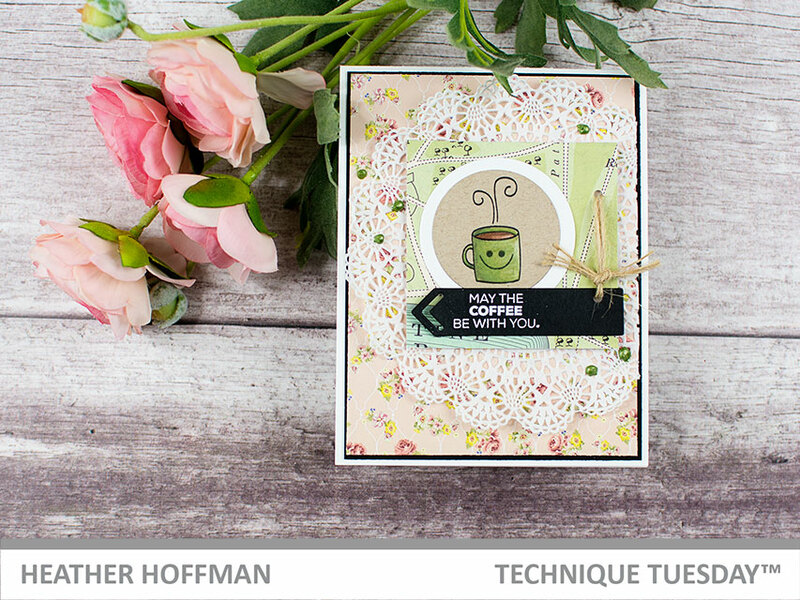 I love the layering on the coffee card... and the sentiment. And your iris card is gorgeous. I had not thought of colored pencils with white embossing over the top. Thanks for the ideas and for sharing you design. Lovely cards! Always like seeing cards made with Kraft cardstock. Thanks for the ideas. I have that coffee stamp. Thanks for the inspiration. Great coffee card. Love the sentiment. I love the beautiful flower card! Love your cards! Thanks for the tip about overstamping after the pencils. So great to see the coffee cup smiling back at me. Such a fun card. The purple iris is beautiful. Two very different & lovely cards. Thanks for sharing. Love the technique of re-stamping over the colored image using the MISTI! Both are great ! One cute, one elegant! Just one more reason I love my Misti!!! I tend to overstamp my image regardless of my coloring method just to freshen up the sharpness of the lines. Your card from today is super cute and the previous card is so pretty!!! Cute and pretty cards. thanks for the coloring tips. Fantastic cards. The little green mug makes me smile. super cute cards! I really like you treatment of the twine! Both cards are great. I'm particularly fond of the iris. 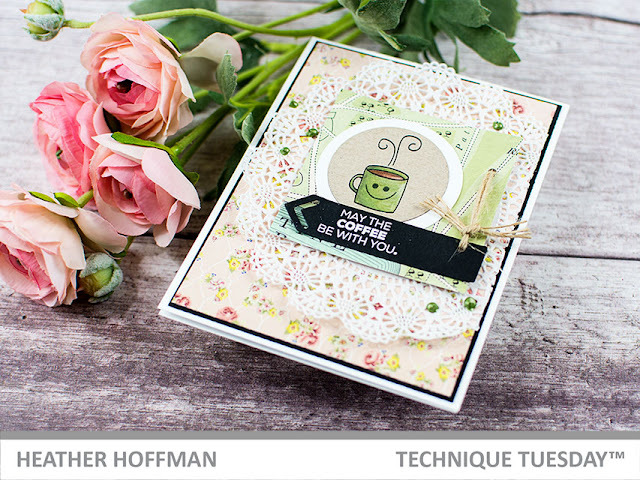 The first card is so enhanced by the doily, and the second card is just plain beautiful! Thank you for sharing. These are two lovely cards ! Wonderful cards! The first is sweet and fun, the second gorgeous. Love the texture from the colored pencil. Your cards are beautiful ! The flower card is also very elegant. Cute coffee card. I totally need that sentiment.. coffee be with you! Really cute coffee card! And I love the flower, too. Both cards are so nice! Love the technique of stamping the image again after coloring it. Both of your cards are fab, adore that iris, so pretty. Can't go wrong with a coffee card! I love the beautiful iris against the kraft CS. Both are terrific cards. I can't resist a cute coffee-themed card! and the flower CAS card is so beautiful. Thanks for the insprations, Heather. I need to remember to re stamp my pencil coloring! cute card! Adorable coffee card! That stamp set has great sentiments! Your iris is beautiful with the white embossing. It really makes the image pop! Your first card is super fun and your iris card is super pretty! Have to try that technique! Two fabulous cards! The first one is super cute and that second one is gorgeous!! Love that beautiful iris. Adorable card with the coffee cup! Love the layering! 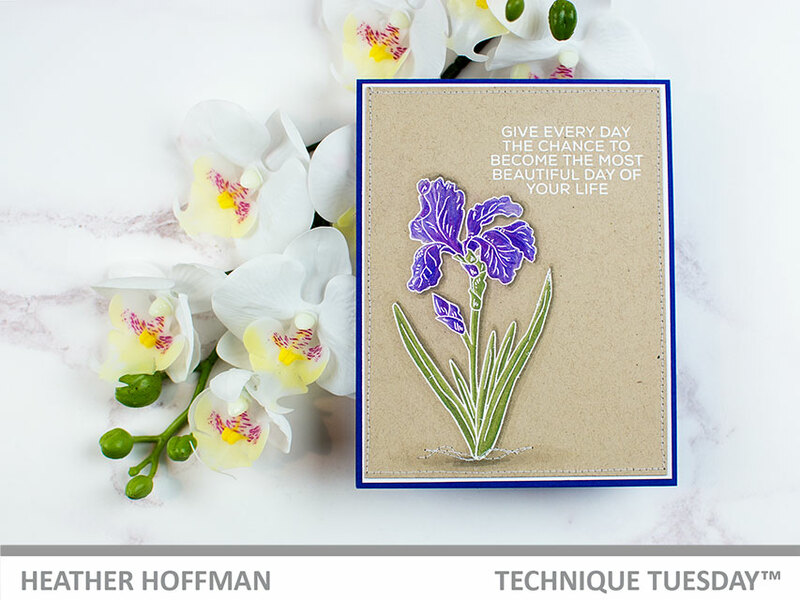 And beautiful iris card! I don't even like coffee but the first one is sooooo cute! The card flower is magnificent :) Thanks for sharing! Wonderful cards! Especially loving the second one! So pretty and sweet! Lovely cards. 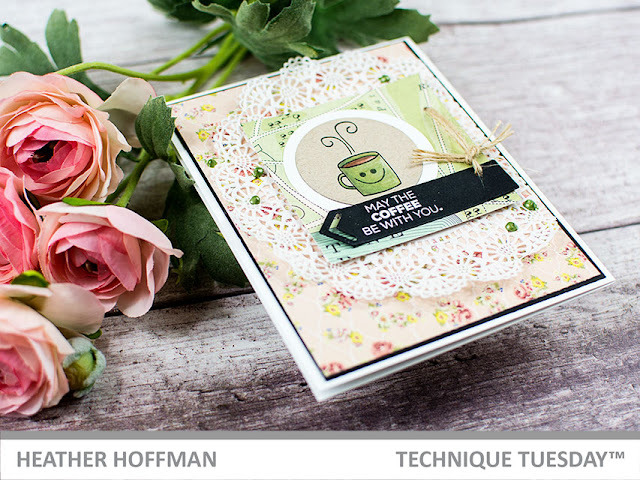 Heat embossing with white after colouring created a beautiful effect. Thanks for sharing.